We had a class of 19 today, we were missing so many of our wonderful friends. Insha'Allah no one is at home sick, and just taking their time coming back to school! We started off our day talking about our Winter Break. Masha'Allah it sounds like everyone had an amazing time. What we did during our Winter Break was the subject of our journal entry today. Masha'Allah the children's penmanship has improved tremendously. We visited teacher Nancy at the library today and she read us the story called The Small Tree. 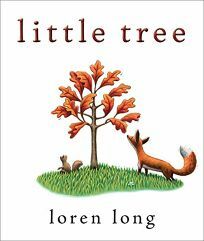 This story is about a tree that has a hard time dealing with change, and letting. The tree finally learns to let go and see what an amazing feeling it is to let go, and start fresh :). Teacher Nancy has noticed how responsible our class is, and she is now allowing them to take out two books at a time masha'Allah. We had reading buddies today, half of the class stayed in SK2 and the other half went to the grade 4 classroom. The kids enjoyed being read to, and insha'Allah we will see our reading buddies again in two week's time. Teacher Ibtissam came in for period four. The class is working on surat al-adiyat and the homework is to work on ayas 6-8 insha'Allah. During French class monsieur Said worked on some new vocabulary.